wow! 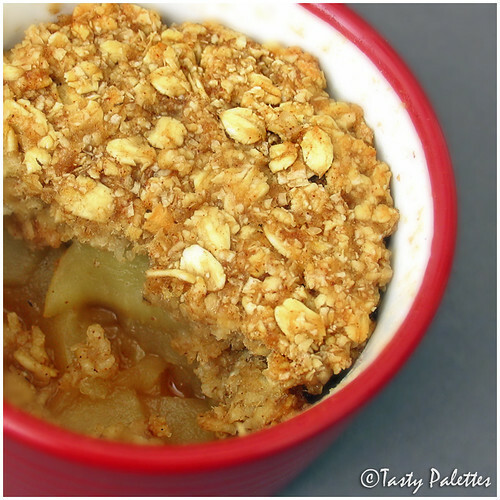 looks really chewy and yummy.. i love apple desserts, they give out such a wonderful flavour when baked..
Those oats were looking like nuts to me! :D Nice recipe for calarie concious! They are just delicious looking. And very healthy topping. Sound totally delicious- and naturally vegan, too! I'll definitely file this one away for colder days, thanks for sharing your recipe! It looks incredible Suganya, I did similar to this but in a m/w with APFlour. Will try ur version, sounds interesting and healthy too! Did I ever tell u that I love those red ramekins! That's truly so good. I like apple pie filling, but the crust dosen't facinate me much. Your recipe is much healthy and yummy. Thanks for sharing. Even the smears on the inside of your dishes look photogenic, Suganya! When oh when will my photos look like that? 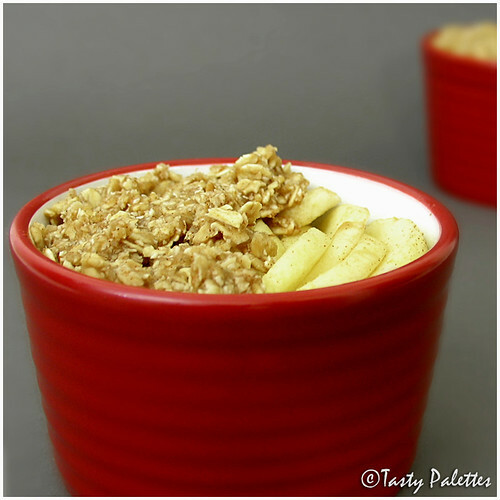 The apple crisp looks pretty tempting and easy to make. Loved your egg pics/clicks. But then all your pics are always out of the world amazing. Looks lovely Suganya. I think I have all the ingredients on hand so will give this a try real soon and let you know! she'll love the surprise if i make it. i dont have some of the stuff on u're list of ingredients, ahve to shop for those. will let u know when i try it :-) thanks for the recipe. oooohh. this will be wonderful with any fruit. replacing some of the applesauce with ground flax may make it crisper. 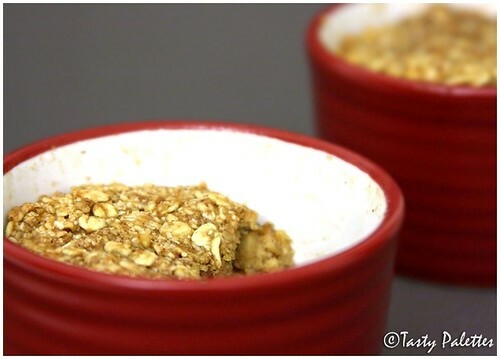 I like the use of oats in this! Looks really good! Apple crumble/crisp.. Anything goes, Raaga. Latha Maami, Here, in the US, almost any dessert is loaded with butter or cream cheese. Delicious they may be, devouring them results in another layer around one's waist ;). And thus the guilt. HC, You said it. Delicious and healthy. Happy to help Rajitha. I have experimented with this enough that I don't even measure anymore. Handful of this and a pinch of that :)... I would love to see one of yr creations in those colourful ramekins. Don't keep me waiting. Oh yes, Sunitha. I hope you like it, you 'Baking Queen'. Hannah, Thanks for dropping by. I skimmed through yr blog. Wow, you have an amazing one. I will go through yr recipes leisurely :). And I try to veganize recipes as much as I can! Thanks Sandeepa, but the truth is, it was taken at around 9 in the night ;). Asha, I totally agree with the sugar part. I am not a big fan of sugar, but the recipe is tweaked so that it is likable to all. The sweeter the apple, less the sugar I add. Microwaving apples is totally trouble-free, Padma. The crust/crisp doesn't get that toasty. But that is fine instead of heating the big ol' oven! Hope you try this Kribha! Oh Sra :D. I noticed the ramekins were dirty (?). Thats because the apples have cooked down and I didn't have the energy to correct it so late in the evening. Thanks for dropping by, Rohini! Sure Laavanya. Let me know whether you liked it. A smart cookie, your daughter is, Latha :). They have a neat way of explaining things. I remembered Cheez It commercial reading that..Haha.. If you are making this for yr daughter, you can use butter instead of apple sauce. Tht makes them crispy and crusty. Pls let me know whether she liked it. Bee, Ground flax may work. But I didn't think flax bcoz we had pancakes with looooootsa flax seeds y'day morning. But thats definitely a good suggestion :). looks yum1 im sure house might have smelled wondereful while baking with apples and spices. thnx 4 sharing will try it soon. do u think running the oats for a sec in the mixer will help it make a bit crispy, just thinking aloud? Wonderful - I've tried hard to make something healthier than buttery apple crumble, without success - but this looks as if the family will devour it. That looks Wow.... so delicious!! I'm going to have to show this to my husband - this is one of those things that capture his imagination, and then he jumps into the kitchen to try it out. This is a tasty twist for the holidays. 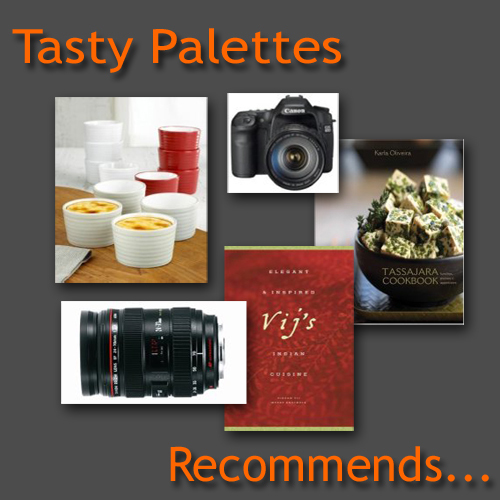 delish - the pictures are excellent.